Climate politics went into full speed in early June 2001. The day before he left for his maiden European tour, Bush dropped his climate bricks and baits. To appease his European colleagues, climate-sceptic Bush acknowledged the severity of the global warming problem for the first time, and said that the us would lead the way by advancing science on climate change. "The world's second largest emitter of greenhouse gases is China. Yet, China was entirely exempted from the requirements of the Kyoto Protocol. India and Germany are among the top emitters. Yet, India was also exempt from Kyoto," Bush said. For these reasons, he said, "The Kyoto Protocol is fatally flawed in fundamental ways." 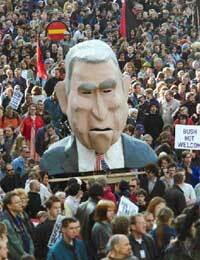 In the Swedish city of Gothenburg where protesters greeted "toxic Texan" Bush with naked backsides and banners during an European Union (eu)-us summit in mid June 2001, the eu was forced to take a stand. It decided, somewhat reluctantly, to part ways with the us. Swedish prime minister and host, Goeran Persson said that the eu would stick with the Kyoto treaty, while the us would "go on with their policy." "Kyoto is not meaningless without the us," defended Persson, "because it is the first step." The Kyoto Protocol can only come into force if it has been ratified by 55 parties to unfccc, including industrialised countries responsible for at least 55 per cent of the emissions of the industrialised countries in 1990. The negotiations have turned into a courtship game, as the eu cajoles, woos or bribes key nations to get the magical 55 per cent number. For the protocol to come into effect without the us, the eu will need Russia and the countries in transition and either Japan or Canada and Australia together (see box: The numbers game, p34). All these countries want concessions in the use of sinks -- using forests, grazing lands and croplands to sequester carbon dioxide to meet their commitments. Sinks have, therefore, become the battleground to make or break the Kyoto pact. And each one of these countries is working hard to get the maximum concessions possible in this great bargain. For Japan's sake Japan is key (for the Kyoto Protocol to come into effect)," admits Svend Auken, Denmark's dynamic energy and environment minister. Russia and Ukraine and the eu account for about 53 per cent. It is the last two per cent that is difficult. Japan is making full use of its power and is blowing hot and cold. Mid-June, Japanese prime minister, Junichiro Koizumi dramatically proclaimed that the Bush administration's position on Kyoto was "truly deplorable." The next day, foreign minister, Makiko Tanaka said, "Japan cannot go ahead with European countries while leaving behind the us. We will make constructive efforts till the end to ratify the pact jointly with the us." Playing all sides was profitable. On June 18, cop-6 president Jan Pronk put forward his revised draft proposals for parties to negotiate upon when they meet in Bonn. This latest draft contained special favours for Japan. Indian scientist, N H Ravindranath, who contributed to the Intergovernmental Panel on Climate Change (ipcc) report on land use, land use change and forestry (lulucf), calculates that through these new proposals, Japan, like other industrialised countries, could meet roughly 50 per cent of its reduction commitments through sinks. However, the catch is that Japan does not have the land area to meet these commitments domestically. It will need to plant trees in developing countries to meet its emission reduction target. Therefore, Japan's participation is in the hands of developing countries who are still holding out on the issue of including sinks in the Clean Development Mechanism (cdm) -- the trading mechanism set up so that the North can buy its emission quota by investing in cleaner power plants or planting trees in the south. If the eu has to make it to 55 per cent it needs Japan. Japan in turn needs the definition of sinks to be expanded and to be given as much leeway to meet its emission reduction target from sinks. For this, Japan needs g-77 to drop its opposition to including sinks in cdm. The bottomline is that the eu needs g-77 and China, for Japan's sake. But by early July positions changed again. At a Koizumi-Bush summit, Japan's premier changed sides. With the country sinking deeper into a recession, he was clearly not in a mood to antagonise his largest trading ally. Although just a week ago he had called Bush's position deplorable, he now maintained that if Washington and Tokyo cooperated, they would be able to "create means that will be more effective in dealing with global warming issues." Koizumi ended the summit visit with an agreement that "he would not proceed without the us." A few days later, this time after his meeting with Tony Blair, uk prime minister, Koizumi said that Japan would make efforts "until the very last minute" to bring the us on board. He left the issue of going without the us open. He has, however, stated clearly that Japan will not make any decisions on ratifying the protocol until cop-7 in October 2001. Japan's prevarication is clearly strategic. Already, nervous negotiators are willing to offer sops to bring Japan on board. Pronk announced that he was willing to agree to extend the deadline for industrialised countries by two years. The uk has announced that it is willing to support changes to the Kyoto protocol, to support Japan's efforts to bring the us back on board. There are also indications that the compliance provisions will be kept so weak as to render the entire Kyoto commitment almost voluntary. Australia and Canada, who hold the other two casting votes, are also keeping their options open. On a tightrope At cop-6, the negotiations with g-77 and China were deadlocked mainly over the issues of finance and technology transfer. These still remain sticky. But developing countries have a new challenge. George Bush's ultimatum could easily turn the tide and they could become the focus of attention. To bring the us on board, developing countries could be offered as the sacrificial lamb. And, if they still oppose taking on commitments, they could be dubbed the problem creator, standing in the way of getting an effective climate regime. The Bill Clinton administration was not very different in its position. It had also made the "meaningful participation" of developing countries the main focus of its negotiating strategy. But it had stopped short of asking for legally binding commitments. Instead, it had concentrated on getting major concessions from developing countries in the use of cdm. The us administration calculated that the use of cdm would allow it to buy its emission reduction targets very cheap -- between us $7-15 billion over the five year period if it could buy 90-100 per cent of its emission reduction through cdm, at a cheap rate of us $10-20 per tonne of carbon. Given that cdm is a synonym for overseas investment -- us companies would sell energy efficient technologies, in return for carbon credits -- it was a double bonus. us negotiators used trick and treat tactics to break down opposition of developing countries to cdm. By cop-6, Southern negotiators were only picking holes in the various rules and definitions of cdm, but everyone wanted the trading mechanism to begin as fast as possible. The second us negotiating strategy was to expand the definition of sinks to make it possible to use just about every creative accounting practice to get credits for carbon sequestration from vegetation. Its interest was to expand the definition of sinks so that just about every shrub, farm or tree would appear in its carbon credit book. Pronk's proposals would allow almost 50 per cent of us emission reduction targets to be achieved by domestic vegetation management. The third negotiating strategy is aimed at getting key developing countries, China and India, to take on legally binding emission reduction commitments. "We are not saying that Burkina Faso has to sign up to this right now, but the major emitters -- India and China -- have to sign now," a us official told the New York Times. lMake the first commitment period of the Kyoto Protocol when industrialised countries are expected to meet their emission reduction targets voluntary. He argues that for the us to meet its targets is too tough and the five years can be a good opportunity to get its act together. In his proposal, the targets would still apply and can be used for trading but there would be no consequences for missing them. lSimultaneously work to make the second period mandatory and to bring in developing countries into the ambit of the protocol. For 2013 to 2017, industrialised countries would face the same targets that were voluntary in the first period, but this time these would be mandatory. At the same time, developing countries would be required to take on targets, but theirs would be voluntary. lBy 2018-2022, industrialised and developing countries would all be in the same system with legally binding commitments. Then there would be no "fatal flaw" in the treaty -- only fatalities in the developing countries. The favourite formula is to give developing countries an arbitrary 10-year grace period, as was done in the case of the Montreal Protocol to save the ozone layer. The South was given 10 years to take on the same commitments as the North, without any attempt to iron out the gross inequities in the use of resources. As yet, the South is taking comfort that the eu is on its side. But for how long? And what compromise will it need to make with the eu to get its support? After all, bringing the us on board is in the interest of the eu, which stands to lose its competitive advantage if only its industry is asked to take on the extra burden of climate change abatement. The g-77 and China will also want the us to participate -- but for another reason. Without the us, the largest buyer of emission credits, the trade under cdm is also expected to shrink. Ecologically effective! With Australia and Canada playing their cards close to their chest and Japan prevaricating, it is clear that for the world to go without the us, it will need to make major concessions. Whether or not the agreement will effectively combat the threat of climate change is quite another issue. Firstly, to bring Japan and others on board, the agreement will be riddled with loopholes. Secondly, without the participation of the world's largest polluter, the us, the global atmosphere will continue to be loaded with increasing emissions. In 2000, carbon dioxide emissions in the us increased by 2.7 per cent according to estimates released by the us Energy Information Administration. Its estimates are that the us released 1,558 million tonnes of carbon dioxide into the atmosphere in 2000, up 41 tonnes from 1999. The American way of life was the major contributor with transportation related emissions, mainly from gas guzzling cars, sports utility vehicles and trucks jumping 2.6 per cent. The average growth rate of us emissions has been pegged at 1.5 per cent annually. By this estimate, by the first commitment period in 2008, us emissions would have increased a staggering 27 per cent or more over 1990 levels. To meet its Kyoto targets, the us would need to reduce its emissions by 33 per cent over 1990 levels at the very least. Small wonder then that President Bush is belligerent about his country's right to pollute. Bush says that Kyoto Protocol will have a serious impact on the us economy. And it is for this reason that he would like to target competition from India and China. Pronk tries to resolve 'crunch issues' In June 2001, Pronk came out with his third version of a compromise text proposal. His first such draft had emerged in the wee hours of the last night of cop-6. Pronk had called it a "balanced" note, prepared with the view to flesh out the most controversial issues with "balanced representation of the participating country proposals." But many saw that the draft had a definite partiality to us positions. 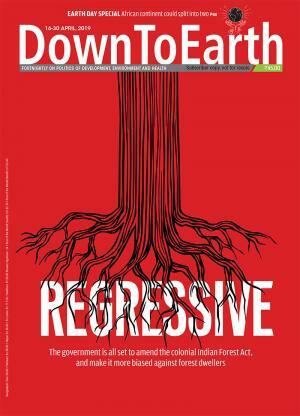 "Either that, or the us demanded so much in the first place, that even in giving them so little, Pronk has given away too much," said the editorial in Equity Watch, a newsletter published by the Centre for Science and Environment, New Delhi. Pronk's draft will be the basic negotiating text for the resumed cop at Bonn. Rubbing salt on wounds The latest Pronk proposal gives nothing to the South, except for words and vague romises. It suggests an adaptation fund to finance both pilot and concrete projects in developing ountries to help them adapt to climate change. It will be financed from the share of the proceeds of the cdm -- two per cent of certified emission reduction (cers) generated. cers are earned as credits for reducing emissions through cdm projects. And a special climate change fund to finance activities relating to technology transfer, capacity building and economic diversification. These activities should be additional but complimentary to those currently funded by the Global Environment Facility (gef) and bilateral and multilateral funding. The fund will be operated by the gef council. In addition, a carrot of us $1 billion is dangled before the cash-desperate South. The proposal says that total annual contributions from industrialised countries towards the adaptation fund, special climate change fund, gef, and additional bilateral and multilateral funding should rise to us $1billion by 2005. About half of the amount is earmarked for adaptation programmes. For the South, the Pronk proposals are akin to rubbing salt on its wounds. Everything that it has fought against is in -- from gef being the main body, to the fact that under the adaptation fund the South will have to pay for its own adaptation. Under this proposal, a part of the cers which the North buys, probably at ridiculously low rates from the South, will be set aside to give back to the South a few peanuts for its adaptation projects. This is an amazing distortion of the polluter pays priniciple. The polluting North is liable to pay for the South's adaptation needs. But by taxing the cdm literally amounts to stealing from the poor to give back to them -- a modern Robin Hood story. Moreover, proceeds from other flexibility mechanisms, which involve only industrialised countries, are exempt from such a contribution. Putting the adaptation funds under cdm means that the North gets away doing nothing with the commitments under the climate convention. Furthermore, the trifle amount of us $1billion per year does not even begin to address developing country's technology and adaptation needs. Moreover, in the absence of a strong deterrent, there is no guarantee that industrialised countries will contribute even this amount. The commitment is not binding, and unlike the earlier proposal of November 23, 2000, failure to contribute does not result in a levy being imposed on Joint Implementation (ji) projects and emission trading.Trading cheap The Kyoto Protocol enlists three flexibility mechanisms, namely, emissions trading, ji and cdm. These mechanisms offer some flexibility to industrialised countries by providing them cheap ways of meeting their emissions reduction target. Emissions trading allows industrialised countries to buy and sell parts of their assigned amounts -- the quantity of green house gases (ghgs) they can emit each year. The protocol lays out assigned amounts for all industrialised countries with reduction commitments. A country that has gone over its emissions limit can buy assigned amount units (aaus) from another country, whose emissions are well within its assigned amount. cdm, a project-based mechanism, enables industrialised countries to earn credits by investing in emissions cutting initiatives in developing countries. ji is similar to cdm except that here investment is made in another industrialised country rather than a developing country. Pronk's proposal is right in stating that climate change policies and measures "should seek to reduce inequalities in per capita emissions of developing and industrialised countries." He adds, "Therefore, industrialised countries must meet their emissions reduction targets chiefly through domestic action undertaken since 1990." This is an issue of intense debate -- should industrialised countries be forced to take measures domestically to meet their emission reduction targets, or be allowed to buy their targets by buying emission credits from developing countries and ailing economies of industrialised countries. The Kyoto Protocol had left the issue ambiguous. Initially, the eu had taken a green stance arguing that the net transfers (non-domestic action) should not be greater than the amount of emissions reduced domestically. The us and its allies opposed supplementarity and finally the Pronk paper leaves it wide open once again. Pronk gives another sop to industrialised countries -- by allowing them to accumulate surplus cers to meet reduction obligations in the second commitment period. This provision means industrialised countries can today buy emission reductions credits at throwaway prices from developing countries and bank them for future use. But developing countries, having sold cheap ways of reducing emissions, will be forced to take recourse to expensive methods when it is their turn to reduce in the future. Although, the host developing country will have the right to decide if a particular cdm project contributes to its sustainable development objectives, and is in line with its national priorities, the proposal calls on industrialised countries to refrain from using nuclear projects under ji and cdm. In order to ensure that cdm projects are equally distributed, simplified procedures will apply to specific small-scale projects to facilitate equitable regional distribution of cdm projects. The proposal also emphasises that use of public funding in cdm projects should not result in diversion of official development assistance (oda). The nuclear issue has been one of the most bitter "crunch" issues. The South insists that it is its "sovereign" right to decide what technology it should adopt and if it wants to invest in the environmentally unfriendly and expensive nuclear -- in other words, if it wants to go to hell -- it is its business. The eu opposes this option because of its green lobbies. The us and allies, don't support it openly but urge the South to consider it as it would suit their ailing nuclear industry interests. The eu instead wants a "positive list" to define what is more environmentally friendly technology. Pronk has left it to the discretion of the buyer. The loopholes The debate over using forests, referred to as 'sinks' because they absorb carbon dioxide from the atmosphere, is becoming more contentious day by day. The Kyoto Protocol asks industrialised countries to reduce their carbon dioxide emissions, but it also provides two 'loopholes' that allow the use of sinks to offset these emissions instead of undertaking real cuts in fossil fuel use. Article 3.3 and 3.4 of the Protocol permit countries to engage in land use, land use change and forestry activities (lulucf) to enhance carbon dioxide absorption by sinks, and gain emissions reduction credits for the gas thus removed from the atmosphere. The compromise proposal on the table for the upcoming climate change talks gives a complex formula to calculate these credits. lmanage the land differently so that more carbon is absorbed, and retained for a longer time, like by introducing cropping techniques that minimise soil disturbance and consequential carbon loss. The Kyoto Protocol had included under Article 3.3 the use of afforestation, reforestation and deforestation (ard) activities to absorb carbon dioxide and gain credits, whereas other lulucf activities like forest, cropland and grazing land management (Article 3.4) were still open for future agreements. Afforestation and reforestation refer to establishing trees on lands where there were none. They are distinguished only by the period when the land was without forest. Planting trees on land, which has had recent tree cover, is called reforestation, whereas afforestation involves land that did not have trees for a much longer period. Deforestation means removing forest from the land and putting it to non-forest use. On the other hand, activities under Article 3.4 are rather vaguely defined and open to interpretation. For instance, forest management practices would simply mean that the country is taking credits for improving the practice of forest management or cropland management. Such an activity could be simply adding nutrients to increase growth rate, pest management, low-impact harvesting where soil disturbance is kept at the minimum, forest fire management and reducing forest degradation. Similarly, areas like grasslands, pasture, savannas and shrub lands are considered grazing lands. Reducing overgrazing, protecting intensively grazed lands, reverting cultivated lands to grasslands, fertilisation and irrigation to increase productivity, introducing plant species like legumes or deep-rooted species and fire management are some of the practices used to manage grazing lands to increase their carbon content. In croplands, most of the carbon is stored in soil as crops are regularly harvested. Therefore, any activity that enhances carbon storage in soils will be crucial for cropland management under the Protocol. Improved water management, higher yielding crop varieties and pest management are ways to increase crop yield. Increased yield causes more carbon to be absorbed by crops, which in turn favours enhanced carbon storage in soils. Conservation tillage, where land is tilled in a way that leaves a lot of crop residue on the surface and thus reduces soil erosion by water, and other soil erosion control techniques can also go a long way in retaining carbon present in soils. Revegetation involves planting small vegetation. This is why at the cop-6, environmentalists angry at this loophole put up placards on small bushes and potted plants in the conference centre saying, "Do not touch. This is an Australian sink." This category is considered to be of a particular interest to Australia where much of the landscape is saline. Agricultural soils are also becoming increasingly saline due to clearing of trees and excessive irrigation. Growing salt tolerant species like saltbush can improve conditions, but such small type of vegetation may not qualify as reforestation. Hence the need for a separate category. Including revegetation may not mean much in terms of credits, but can be helpful for politicians in winning people at home. Critics say these will be impossible to monitor and even more impossible to verify. It is for this reason that this issue was the deal breaker in The Hague. But now with countries desperate to bring the polluters on board, sinks of any colour and size may just make it through. In his proposal, Pronk allows revegetation and forest, cropland and grazing land management as eligible activities, essentially giving an advantage to countries like the us, Australia, Russia and Canada with large land areas under forests, grazing lands or croplands. Pronk's proposal offers a three-tier method to calculate credits arising from activities under Article 3.4 in the first commitment period (2008-2012). In the first tier, countries can fully count carbon dioxide removed from the atmosphere through forest management, up to the level of net carbon dioxide emissions reported under Article 3.3. If more carbon dioxide is released due to deforestation than is absorbed by afforesation and reforestation, net emissions are reported in Article 3.3. But annual credits in this tier are capped at 8.2 million tonnes of carbon (mtc). The limit can be extended to 13 mtc, if the country meets certain criteria for energy efficiency, forest cover and population density. Beyond the first tier, countries get only 15 per cent credits for forest management. A discount factor of 85 per cent is applied to exclude carbon dioxide absorbed due to natural ways, or due to effects of practices employed before 1990. This is done because Article 3.4 calls for separating carbon dioxide absorbed due to human-induced activities from absorption occurring naturally. For example, only forest regeneration done intentionally will be considered as opposed to regeneration happening without human assistance. Carbon dioxide absorption, which can be attributed to activities undertaken before 1990 is also not considered for credits in the first commitment period. For instance, carbon dioxide being absorbed due to nutrients added in 1989 cannot be considered for credits. But, it is extremely difficult to attribute causes to the change observed in carbon content and separate human-induced effects from natural, and pre-1990 from after 1990. In order to overcome this problem, the proposal takes refuge in the discounting factor, whose value is very arbitrary. Strangely, no discounting is applied to the first tier, even though those credits are no less riddled with such problems. There is no reason to award full credits in the first tier except to compensate countries for their emissions under Article 3.3. Lastly, in the third tier, full credits for agricultural management, which comprises cropland and grazing land management, and revegetation, are given (see table: Calculated commitments). The proposal imposes an overall limit on the sum total of credits gained from the second and third tier, and those from lulucf projects under ji and cdm. There is no explanation why credits from first tier or Article 3.3 are not included in this total. In case of countries, which can increase their emissions over base year levels or have to maintain at those levels, this limit is fixed at 2.5 per cent of emissions in the base year. This means a country like Russia will not be able to use sinks to take credit for more than 2.5 per cent of its base year emissions. On the other hand, for a country required to reduce its greenhouse gas emissions below base year emissions, the total should not exceed 50 per cent of its Kyoto target. So a country like the us can meet up to 50 per cent of its target using sinks. Calculation shows that this formula will help the us to fulfil most of this 50 per cent through sinks projects at home. However, Japan can only meet 13 per cent of the Kyoto target from domestic sinks projects under second and third tier. It will be dependent on credits from lulucf projects under ji and cdm for the rest 37 per cent. The issue of including sinks in cdm was controversial with key developing countries like Brazil holding out. Pronk says that, as a compromise, only afforestation and reforestation projects, and not forest management practices or grazing or croplands will be eligible as cdm projects in the first commitment period. The Subsidiary Body for Scientific and Technical Advice (sbsta) will develop modalities on the many problematic issues that plague the sinks issues, including how the world will ensure that the credits are both verifiable and permanent. The bottomline is that the many compromises will make the Kyoto Protocol not even worth the paper it is written on. The Kyoto Protocol is a grand fudge account where every polluter is working overtime to make sure that it is business as usual, if not better. In all this, the role of the g-77 and China has been pathetic. They have shown little political sagacity in the negotiations. Instead, each cop sees this largest grouping of countries squabbling over funds and technology transfer -- discussions in which they have never won anything, except for empty promises and deceit. It is almost as if the larger issues of an effective climate regime do not concern this group of the most vulnerable countries. Nobody will suffer more from climate change than poor countries -- and not just the small island states. Emerging science tells us that climate change will be measured in signs of greater climatic variation and extreme events. What then will happen to the millions of poor people of the Sahel region of Africa, with its already degraded ecosystems, if there were increased periods of water stress, or drought? In each such case of flood, drought or sea level rise, people living at the very margins of survival will be even more vulnerable and dispossessed. Therefore, it is in the interests of developing countries to demand that the industrialised North take effective and measurable action to reduce its emissions. Current Kyoto negotiations are only about creating a carbon market -- and not about finding effective ways of averting the climate crisis. This is why negotiators while away their time arguing about additionality, fungibility, supplementarity, cers and sinks, and not about action that is needed to reduce existing carbon emissions to sustainable levels. If they do this, they would find that the only way ahead is to move as fast as possible towards zero-carbon energy production systems. In other words, governments have to reinvent the global energy systems, and do this as fast as possible. The Kyoto Protocol, on the other hand, takes the world in the opposite direction. The entire discussion on cdm is about technical modalities and not about the fact that this mechanism could easily end up being the biggest subsidy for fossil fuels and will lock developing countries further into fossil fuels and the world into global warming. This is because of the insistence of industrialised countries to look for least-cost options. Unfortunately, the cheapest options are in improving the fossil fuel sector -- coal washing, for instance, can give a tonne of carbon saving for as little as us $3. Instead of squabbling about a few dollars more in aid, the South must show political leadership in demanding that the cdm funds should only be invested in renewable energy systems that will leapfrog it into cleaner energy systems. The South has the advantage of not being connected to the fossil fuel grid and therefore, can provide a necessary headstart to allow the penetration of these technologies. Once the market for zero-carbon systems grows and begins to compete with fossil fuels, the climate crises will be averted. But for this, the North has to invest more today. The current proposals on cdm will encourage the current generations of developing countries to sell off their cheaper options, leaving future generations straddled with higher cost options for emission reductions tomorrow. It is important to realise that sooner or later, the South will have to take legally binding actions. This is simply because the North is doing precious little to change its domestic energy systems, the current cause of global warming. cdm therefore literally forces the cash-strapped South to discount its future. What the South also does not see is that the climate change negotiations are possibly the biggest cooperative enterprise that humans have ever embarked upon. But this can only happen if there is a sense of fairness in the burden sharing arrangements. Coercion also works, but rarely lasts. Long term cooperation only comes when there is a fair deal. The South should put reply to the us asking for its participation by demanding a framework that is just and equitous so that all countries can learn to live within their share of the global atmospheric space. It is for this reason that it should argue that the issue of equity is important in climate change negotiations. Firstly, the total greenhouse gas emissions have to be limited, and therefore, shared. As these emissions are closely linked to economic growth, and if we remain in a carbon-driven economy for long, then restricting carbon dioxide emissions will also mean limiting economic growth. If there is a freeze in economic inequities, then it is bound to be unacceptable. The only way would be to set up a framework of equal per capita entitlements so that each nation has a share of the global atmospheric commons. The entitlements can then be used to trade -- and will provide poor nations the incentive to invest in cleaner technologies so that they protect their unused share of the atmosphere. This would be a win-win situation.